PASADENA, CA­—Nearly a year after Curiosity’s triumphant Mars landing, scientists at the Jet Propulsion Laboratory announced today that the NASA rover is preparing to explore a large structure six kilometers south of the Gale Crater, which preliminary reports indicate is an enormous Martian synagogue. “There appears to be a wheelchair-accessible ramp near the main sanctuary entrance by the stone replica of the 10 Commandments, so our plan is to collect samples from there, and then continue past the member services desk to the Lebowitz wing,” project scientist Joy Crisp said of NASA’s plans for the upcoming mission, which also include taking photos of the Jewish Community Center two kilometers southwest of the temple. 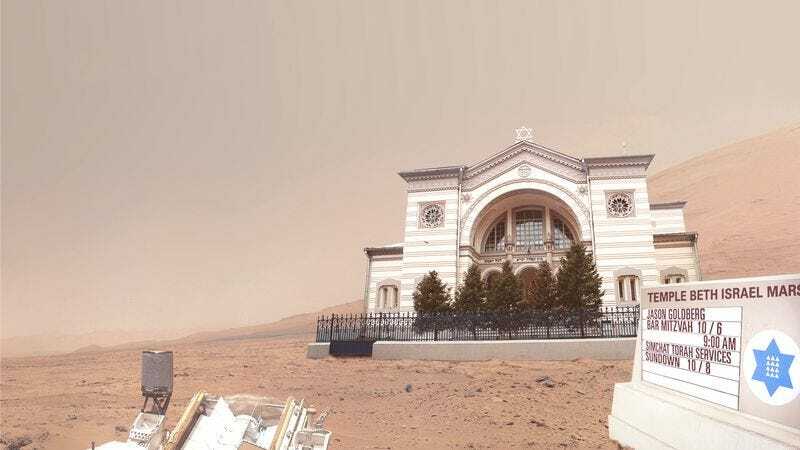 “If our early thermal imaging and soil samples bear out, it appears as if Martians would congregate in the JCC’s steam room, stop at a nearby delicatessen for lox and bagels, and then file into the synagogue for services. Analysis of some discarded Havdalah candles could mean that not only was there life on the Red Planet, but that it was fully capable of observing the Sabbath.” Crisp added that scientists at the Jet Propulsion Laboratory were eager to analyze a theatrical playbill believed to be from the JCC’s performing arts annex, which, according to the document, staged a popular production of Fiddler On The Roof starring a 12-year-old Seth Schwartz as Tevye.